Well, by now all will be on the way to be being revealed and we’ll see who’s avoiding the penal stuff most of the time and who isn’t. You have to be careful with rough, whether you’re the USGA, who specialise in lots of it or a day-to-day club who should bear in mind the relative lack of skill of most of its members and visitors. Those members and visitors may say they want to be tested but mostly they want to be able to get round the course without losing too many balls or straining too many wrists and if possible they want to come in and talk about their good shots and the odd par or birdie rather than the brilliant hack out of the rough at the 3rd. 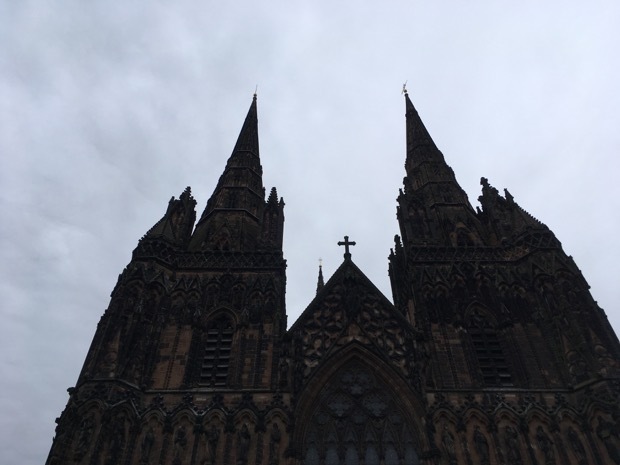 Lichfield Cathedral, famous for its three spires. 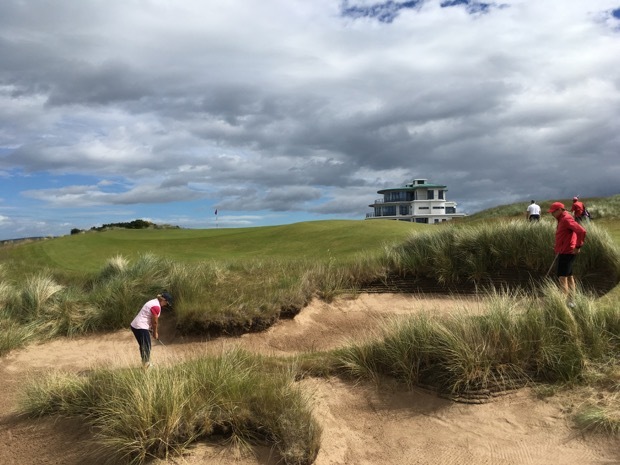 I played at Castle Stuart, near Inverness, last weekend, in the Spire Trophy – as a resident of Lichfield I felt a bit bereft that there was only the one spire because we’re used to three – and I couldn’t have had a better time. In the fourballs my partner and I proved overmatched against superior opponents who played well and we were hammered, by the old dog licence. Even so I really enjoyed it. The weather was grand, so there were stunning views of the Moray Firth and the Black Isle, the company was good, I hit a lot of decent shots but I was clumsily clueless around the greens. The lines, read by my caddy Stuart, were fine but my inability to gauge the pace was frustrating. I nearly started laughing at one point because I thought of Bernard Darwin lamenting that his partner, the incomparable Joyce Wethered, was tied to a turd. Nothing like delusions of grandeur! They’re very clever at Castle Stuart because they set the course up to appeal to every level of golfer, bar absolute beginners. There are plenty of hazards and rough but it’s not really what you see from the tee. You see a playable golf course that is not too narrow, with no wasp-waisted fairways, no monstrous carries and rough that is subtly graded. If you come from a well-grassed, parkland course (which I don’t), it’ll all be a bit alien to begin with but it’s worth persevering and discovering the joys of using putters and rescues from well off the greens to negotiate the ‘umps and ‘ollows. Bliss, really. Sometimes you do put your partner in trouble, just so she can show off her skills. 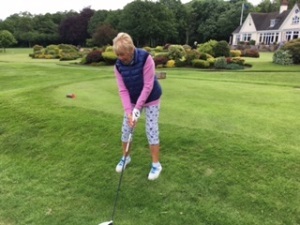 In the foursomes on Sunday, my partner, the incomparable Gillian Stewart, and I came back from two down with five to play to halve the match and the overall match was also halved, for the first time. Smiles all round. 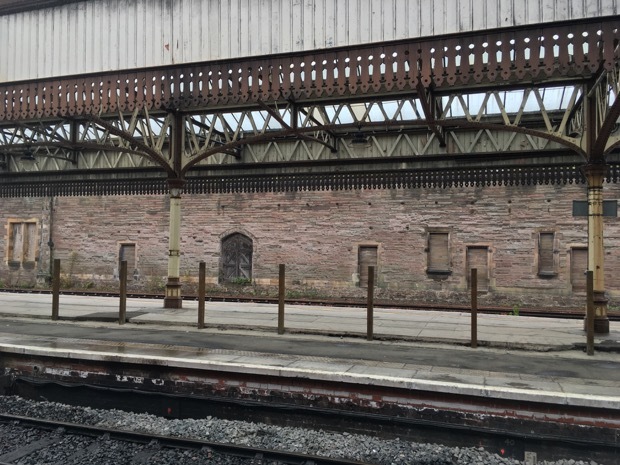 Inverness is a long way up – more than nine hours on the train from Lichfield, though planes are an option if you can stand airports – so it’s worth considering staying a while and not just confining yourself to marquee names like Castle Stuart, Nairn and Royal Dornoch. Don’t overlook unheralded northern gems like Fortrose and Rosemarkie (all one course), Tain, Brora and Golspie, to name just a few. Scotland almost rivals Ireland as a golfer’s paradise….Play away please. 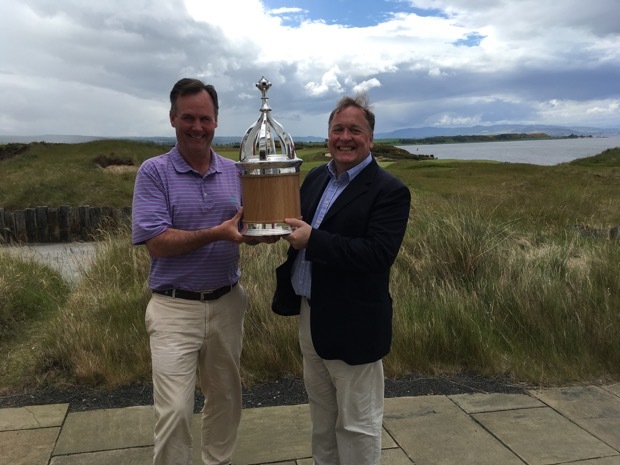 Captains Stuart McColm (left) and Simon Chapman share the beautiful Spire Trophy. Player and course (Little Aston) looking immaculate. luggage (which makes a change from mush). There was a time when I was a pretty good packer, accustomed as I was to hopping on and off aeroplanes but I don’t do that any more and travelling by car is not good for encouraging minimalism – better take that extra jacket just in case; throw in the extra golf shoes; plenty of wine for the hosts; a brolly; big bottle of sunscreen; woolly hat; spare this; another that; laptop and leads, all higgledy-piggledy, stuffed into a corner; those letters I meant to answer; bank statements I was going to study forensically; that library book on A Day In The Life Of The Brain; no need to pack neatly; and golf clubs? No problem at all. Except that I baulked at driving to Inverness on my own – I did St Andrews not so long ago and that was bad enough and did nothing for my golf. My game is an unpredictable, rather delicate flower that needs nurturing and tlc (tender loving care) not dlz (driving long distances like a zombie). So, lacking a chauffeur or, even better, a spare helicopter, I opted to let the train take the strain. Alas, that also means me taking the strain, even if I was using wheels, which I’m not because I have some vague notion that I’ll go trekking round South America before too long and need to practise travelling really light and be prepared for all terrain. 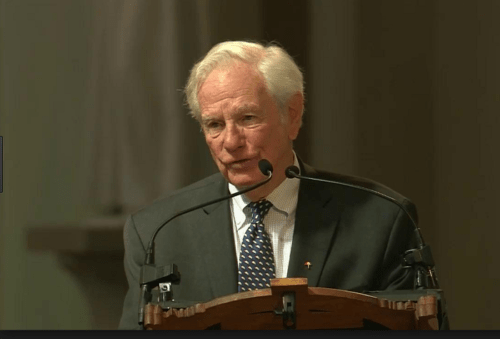 Notions and delusions! Anyway, even with wheels, there’s a fair amount of lifting and straining involved in travelling with luggage, especially when you include golf clubs in the mix. Not that train companies seem to cater too well for baggage these days. Are there still baggage cars? Maybe I missed it. Or have studies shown that people using trains are a non-travelling species who don’t carry stuff, that all those bags and suitcases are an illusion? 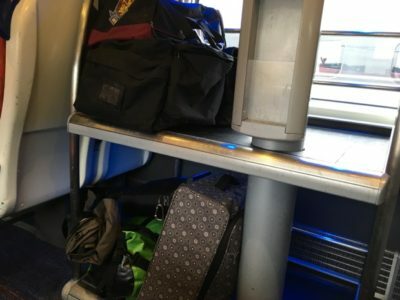 The designated space for luggage in my carriage had a blooming great pole up the middle, making storing your stuff a bit of a Krypton Factor-type test of your spatial awareness and ingenuity. Thank goodness the train wasn’t too busy and the rucksacks going to the Lake District could be accommodated on spare seats. Good thing train not busy. Luggage for three. 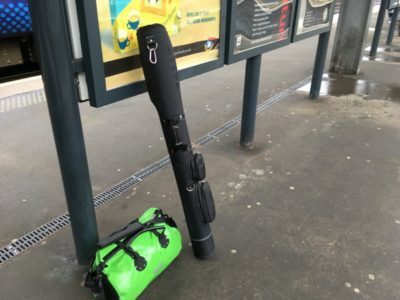 Overhead – although this seems to vary from carriage to carriage, train to train – there was barely any space even for fishing rods, some of which can be broken down, or, more likely, broken, and as for golf clubs, well, good luck. I’d been persuaded to bring my own clubs instead of hiring a set at Castle Stuart, my ultimate destination. Bad decision. The good thing was that it did give me the chance to rail-test a neat tube of a bag that I bought at Valderrama (at some expense, natch) many years ago. It was when Nick Faldo was in his heyday, so the bag has spent many years indoors (cupboard, garage, shed) housing a couple of refugee persimmon drivers, a battered baffler by Cobra and some putters. Now, this bag, designed by Bally and endorsed by Faldo is tough and resilient and holds my small set – big-headed driver, 5-wood, rescue, irons 7, 8 and 9, wedge, sand iron and putter, plus a towel and a bottle of kefir nice and neatly. The fatal flaw, which turned it from being the ideal holiday bag into a blooming nuisance, was that it hadn’t been endorsed by Fanny, Faldo’s caddy. The bag has a long carrying strap but it’s useless because the balance is all wrong; it’s an ill-thought out adjunct designed, presumably, by people who had no idea that golfers ever carried their own bags on the golf course or might desire to do so. Still, dispense with the strap and just use the handle and it’s grand as a protective container, if still a bit of a fag for train travel. On mature, aching reflection, I realised that my adviser was a professional player whose equipment matters to her because she knows what she’s doing and likes to know what her clubs are likely to do. That’s not so necessary at my level; I rarely know from one shot to the next what I’m doing, so I suppose my clubs are versatile and prepared for anything. They’re also an ageing mishmash and it was a mistake not to take the chance of trying out a newer, swankier set. I’m probably ready for a change but Maureen insists I have a course of lessons first, to make sure it’s worthwhile. Hope I have a patient partner this weekend! Nearly there? Perth. Only a couple more hours to Inverness. Scotland goes up a long way. Should have been playing at Blairgowrie or Gleneagles perhaps! 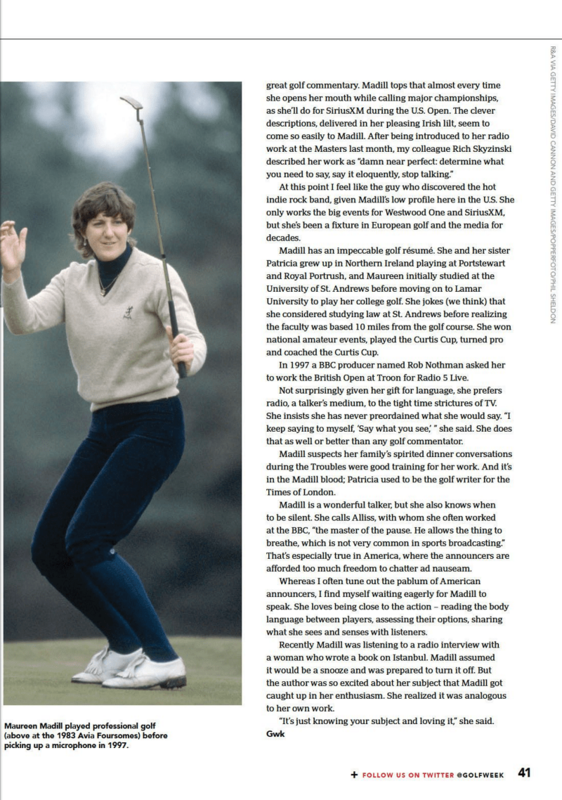 This Monday coming, Maureen was due to be heading off to the US Open at Erin Hills but she’s been having trouble with her skin – that’s a lot of an understatement, I’d have had the screaming abdabs long ago if it had been me – and realised she had to give up the unequal struggle and pull out. Long, long days in the hot sun, coping with equipment, notes, concentrating on the golf and the bon mot, wouldn’t work if all you want to do is rip your skin off and dive into a soothing bath of olive oil. It’s a pity because she loves the work and it suits her down to the ground – we’ve always been a garrulous lot but Mo doesn’t just gab and waffle, she knows what she’s talking about. 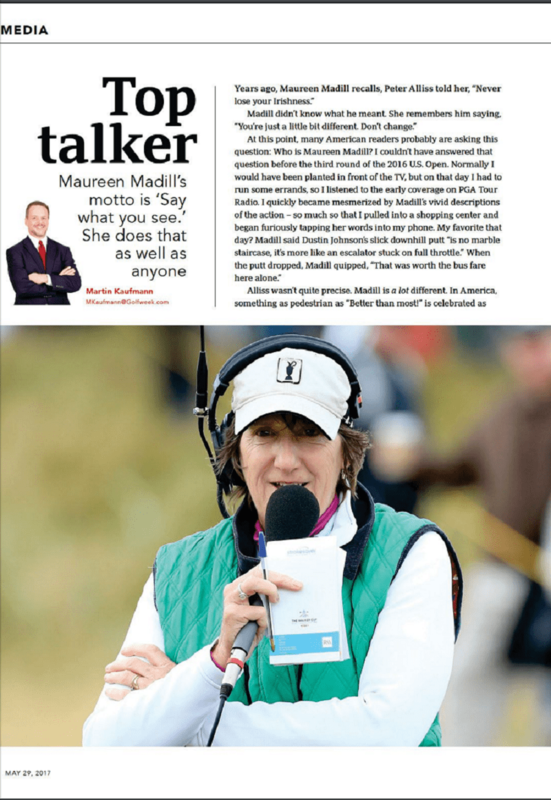 At least one of her listeners will be disappointed too: Marty Kaufmann, the travel editor of the ever-informative Golfweek, based in Orlando, Florida, also writes the media column and he’s a fan, as the piece below shows. Thanks to him and Golfweek for the kind words. 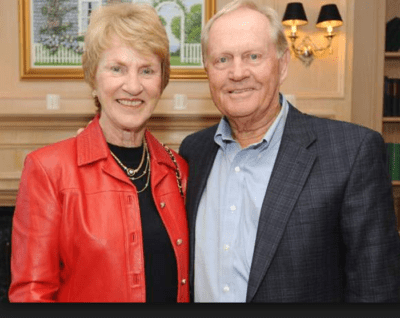 Any time you’re invited anywhere by Jack and Barbara Nicklaus, you say yes please and if you’re invited to the Memorial Tournament at Muirfield Village in their home state of Ohio, you’re jumping up and down with delight and ensconcing yourself for the week, not just for a couple of days. The Memorial is Jack’s baby and every year there are honourees/honorees, both playing and journalistic and there is a plaque for each person honoured. Barbara and Jack Nicklaus, two of the best. Maureen and I went there in 2009 – can’t believe it’s so long ago because it’s so fresh in the memory – because Dai, my husband, was one of the journalists honoured, in his case posthumously. Fortunately, Maureen and I were still breathing and knew even before we set off that we’d never have another experience like this. We were right. At a lunch, Maureen was standing around when Barbara Nicklaus came up and introduced herself; then it was Tom Watson; then it was Jack. It was golfing heaven. The professional honourees that year were JoAnne Carner, whom I knew fairly well from covering the LPGA Tour and Jackie Burke, whose wife had been at college with Maureen, so, really, we were away in a coach. We had breakfast with Padraig Harrington, chatted to David Feherty in the hotel bar – where he told us that his alcoholism was doing press-ups in the car park, just waiting for him to slip up – and wandered around in a delighted daze. We treated ourselves to a facial and full make-up on the day of the presentation – I managed to keep my acceptance speech to the requisite four minutes, miraculous and think I didn’t disgrace myself in front of that consummate master of ceremonies Charlie Mechem, who is still doing the job. He’s a long-standing friend of Jack and Barbara and was for a few years commissioner of the LPGA, making that difficult job look delightfully straightforward! Every tour should have a Mechem at least once in its lifetime. The incomparable Charlie Mechem, a man for every occasion. For some reason, there was no photograph taken of me being presented with Dai’s plaque, so we ended up going down to Jack and Barbara’s house, where we had a happy snap taken, much to Mo’s disgust. The reason? She’d assumed all the formalities were done and had headed out to the golf course to watch Olly (Jose Maria Olazabal), dressed in her oldest sun top, secure in the knowledge that she could top up her tan and was unlikely to meet anybody that she knew. Instead, I track her down – there are thousands of spectators and it wasn’t easy finding anyone – and haul her off to have our photo taken with our hosts. The photo has pride of place on my desk but Mo can’t stand it – all she sees is that tatty top – and insists it has no place there, making her cringe with embarrassment. She has banned it from the blog. On the Saturday of the tournament, we abandon golf watching and go shopping, so when we get back, Mo stops off at the hotel reception to check the scores while I go up to the room. Next thing I know she’s knocking on the door – why? She has a key – and when I open it, a little indignantly, she pushes past me, gesticulating madly…..Tiger, Tiger’s next door…….She’d bumped into him, struggling with his key and an inordinate number of takeaway bags and exchanged pleasantries, congratulating him on the 68 that had got him back in contention. The next day, he played superbly, had a 65, with birdies at the last two holes, to win by one shot from Jim Furyk. It was a masterful performance, full of exciting shots, his fourth win at the Memorial. 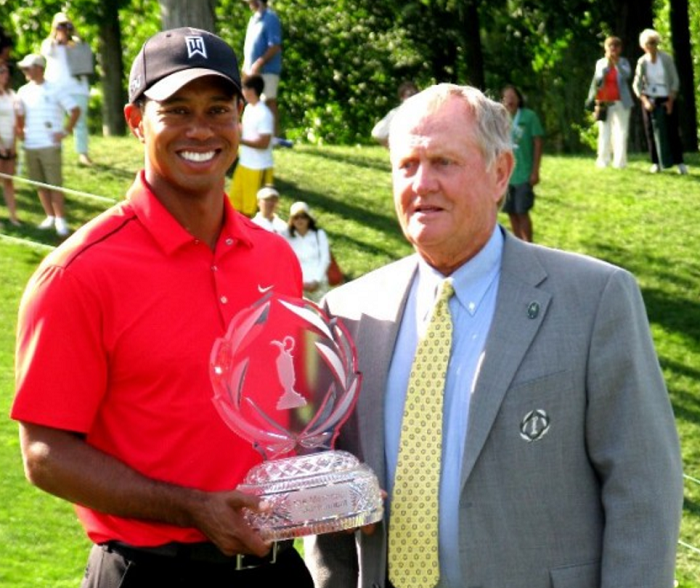 Jack presented the trophy and predicted that Tiger would win his 15th major at the upcoming US Open and overtake his total of 18 major titles within two or three years…..
Tiger with Jack in happier times. It never happened and now we have the latest, sad, sad, horrible pictures of Tiger in decline, arrested by the police, looking lost and broken, a man with no idea who he is or where he is. He needs help and if he has any friends, he needs them now.